Join us on Saturday 28th May from 8pm for a wild night of Tropical Soul and Cuban street food. £20 per ticket includes a night of sensational Tropical Soul music and a delicious smorgasbord of Cuban street food. 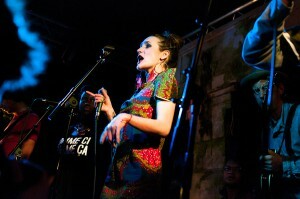 Holly Holden is London-born singer and songwriter, whose unique, bilingual sound is shaped by long-term musical links with Cuba. She performs as ‘Holly Holden y Su Banda’ – an electric trio that combine fresh soul-pop tunes and Caribbean rhythms in a sound they call ‘Tropical Soul’. Don’t miss out on this awesome event that is sure to bring the NYR stable yard to life! Only 100 tickets available, call 01326 221595 to order yours!